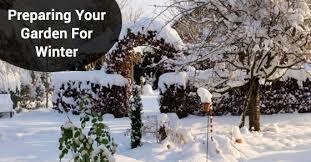 If it snows, remove snow from your evergreen shrubs to prevent the branches from breaking. Tap the branches gently to do this, from the bottom up if there is heavy snow. Minimize traffic on frozen lawns to reduce winter damage. Clean your patio furniture and keep it covered or stored away for the season. Cut down dead perennials. This can also be a time to divide perennials and plant them elsewhere in your landscape or share with friends. Apply an end of season fertilizer – this is the most important application there is. Grass roots will continue to grow during the winter and need nutrients to promote a healthy root system. All rain and snow drains should point away from the home to avoid foundation problems. Remove attached hoses, drain out the water and store them away for the winter to prevent cracking. Shut off outdoor faucets inside the house and leave the outside faucet open to drain out any water in them. Treat broadleaf evergreens with an anti-desiccant to prevent wind burn. Give us a call or email to discuss plans for next year!